A caring, nourishing rinse out hair mask for blonde color treated hair and natural blonde hair that targets porous, damaged areas with intense replenishment. 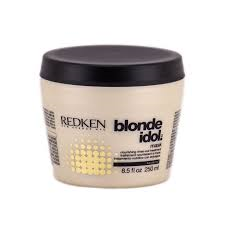 Redken's exclusive Kera-Bright System with kerabond, violet leaf extract and lactic acid helps strengthen* hair, replenish smoothness and amplify shine so blonde hair is polished with renewed softness. Gel texture renews softness and amplifies shine. After shampooing, apply to towel-dried hair. Leave on 5-15 minutes. Rinse thoroughly. Apply daily or weekly as an intensive treatment. Use as a rinse-out treatment.